We have joined several neighboring properties, including Monticello, in establishing beehives to increase the viability of local honey bee populations, which are currently under stress. Our participation in this project is for ecological stewardship and, in future years, a more fully interpreted farm demonstration area. The Highland Bee Project provides an opportunity for community members and visitors to offer their financial support. Donations help defray the costs for bees, hive materials, and fencing. Donations are accepted at the Museum Shop in the form of cash, credit card, or check (made out to: James Monroe’s Highland, memo: Bee Project). You may also donate online using the link below (select “Highland Gifts 1192” and enter “Bee Project” in the comments section). Donors are the exclusive recipient of a jar of honey gathered in the gardens and produced by bees at the home of James Monroe. Jefferson’s original quarter farms, which is now home to the Center for Historic Plants. In 2014 Paul added a third apiary, this time at James Monroe’s Highland. He maintains an active career in the financial planning field, while working year-round on this rewarding and worthwhile endeavor. 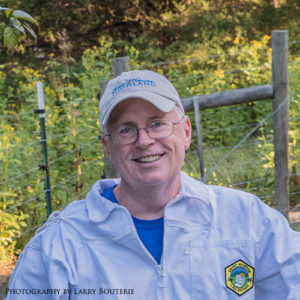 He is committed to helping the apiaries provide valuable pollination services for the gardens of these historic properties and area farms, and to harvesting honey to benefit each institution. 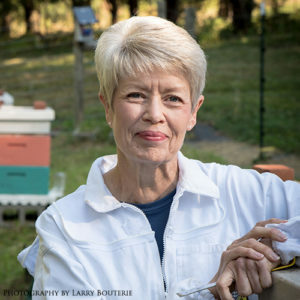 Leslie Bouterie serves as the assistant beekeeper at James Monroe’s Highland, Thomas Jefferson’s Monticello, and Tufton Farms, and as a ceramics researcher at James Madison’s Montpelier. After moving to Charlottesville from Washington, DC where she worked in museum education and development, Leslie quickly became involved with all three presidential homes in the area. A 2015 summer volunteer stint in the Highland and Monticello apiaries fueled her interest in honeybees, and quickly led to her taking a beekeeping course, attending lectures, doing research, and eagerly committing to further apiary service. Despite the need to carry an Epipen, she is passionate about honeybees and is dedicated to fostering the area pollination project.